Many of my favorite childhood summertime memories involve riding my bike in our neighborhood. My orange Sundance bike racked up a lot of miles going to friends’ houses, across the bayou bridge to get an ice cream or slush at Sonic, or to load up on candy at the nearby drugstore. I miss those days of freedom, just getting on my bike and riding…without a helmet! 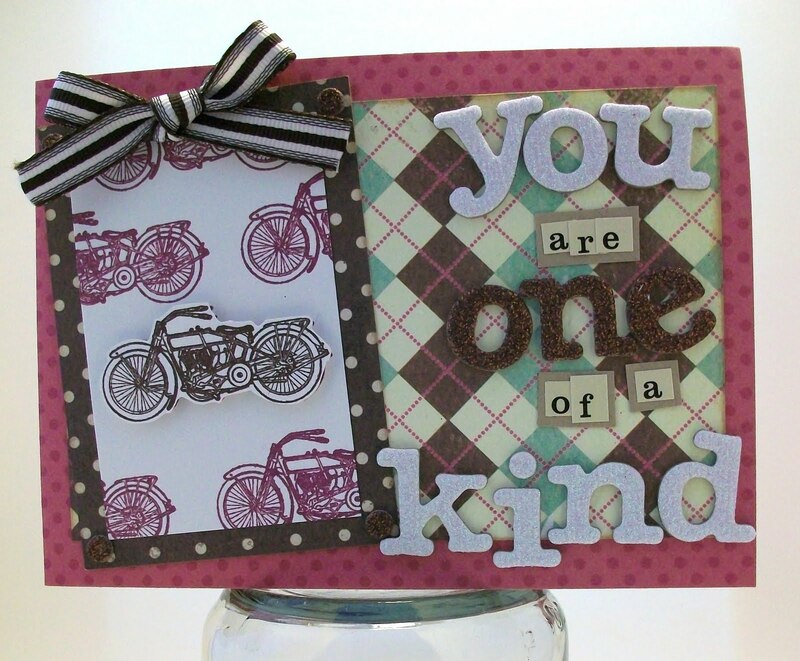 The card I made for the “I Want to Ride My Bicycle Challenge” uses the only bike stamp that I have. It’s from Crafty Secrets’ Favorite Fellas set. I stamped the background bikes in Rich Razzleberry, and I used foam squares to pop up one of the bikes that I stamped in Chocolate Chip ink. The card base is Bo Bunny Double Dot, and the patterned papers are from My Mind’s Eye. I used glitter Thickers and Cosmo Cricket Tiny Type for the sentiment. Love how you pop dotted the bike out of the paper. Very nice card!